his musical journey began in 1978 when he played in clubs in Paris with Chet Baker, Jean-Louis CHAUTEMPS, Pepper Adams and Slide Hampton. It played in 1981 in Alby 5tet of Cullaz with Michel Graillier, Eric Lelann VANDER Christian and then joined the 4tet Charles BELLONZI. In 1982 Patrice CARATINI is called to play in his ONZTET. In 1983 he recorded his first album under the direction of Jean-Pierre MAS with Henri TEXIER and André CECCARELLI. He participates in big-band Antoine HERVÉ in 1984. 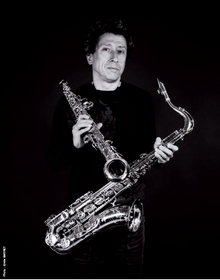 In 1985 he founded the Trio "BARRET / ROMANO / TEXIER" and also played in the saxophone quartet With J.-L. CHAUTEMPS, François Jeanneau and Philippe MATÉ. In 1986, F. JEANNEAU him to play in "The National Jazz Orchestra." 1987 is the year of the creation of the famous 4tet with Marc Ducret, Hélène LABARRIERE and Peter Gritz. In 1997 he plays in ONJ, edited Didier LEVALLET. In 1998 he created a new 4tet "NEW SHAPE" with Sophia Domancich, Riccardo Del Fra and Jean-Jacques Avenel and Simon Goubert. That same year he also creates a duet with S. GOUBERT "LINKAGE". Again in 1998, a new formation was created, the trio "BARRET / ALLOUCHE / Lazarevich. In 2004 Eric BARRET creates 7tet "MY FAVORITE SONGS" with Airelle BESSON, Pierre-Olivier GOVIN, Éric LOHR Benjamin Moussay, Éric SURMENIAN and Joe QUITZKE. Conductor, soloist, composer and author of numerous educational, Éric Barret front leads his artistic career and educational work on the transmission of jazz at the Conservatory of Music in Bagneux (92) where he is a teacher, as well as stage of the festival of Marciac (32) director education. The Lorrain' saxophonist PETIT Julien carries us through his compositions in a jazz world slam unique and transcendent. In "Continuum"